It will be months before we know the full impact of Hurricane Harvey. It’s one of the deadliest storms in decades. It’s also likely to be one of the costliest in history. For now, dollar estimates of the damage are probably low. But they hint at the pain that lies ahead. JPMorgan expects insured losses from Harvey could be as much as $10 billion to $20 billion, making it one of the 10 most costly hurricanes to hit the U.S.
Harvey’s cost could top $100 billion. Much of that damage will be to homes and the infrastructure that government will have to repair. Because of high costs and little coverage, few homeowners have flood insurance. Estimates are that about 15% in the Houston area have coverage. Many of those homeowners will learn that the payments are not enough to rebuild. The government will rebuild roads, power lines, schools and other buildings. At times like this, the government spends money it doesn’t have. Increased debt is certain. While insurers will pay out very little, some companies face losses. Analysts expect Allstate Corp. (NYSE: ALL) to see its earnings per share drop by $0.89 this year. Factoring that into estimates, the stock trades at a premium to its sector and should be avoided. But that’s not true for all the insurance companies. 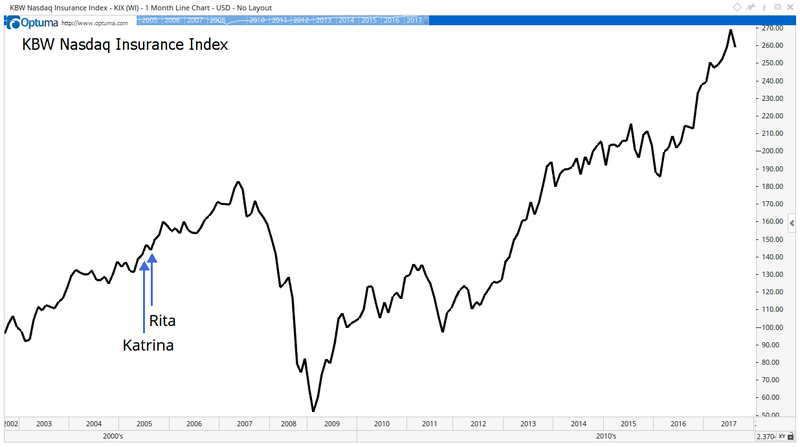 In the past, the KBW Nasdaq Insurance Index, which tracks the sector, dipped and then rallied after natural disasters. The back-to-back disasters of Hurricanes Katrina and Rita are highlighted as one example. These two hurricanes and Hurricane Wilma, which occurred at the same time, made 2005 the most disastrous year for insurance companies. Insurance losses totaled some $117 billion that year. Despite the large payouts, the insurance industry delivered gains to investors. 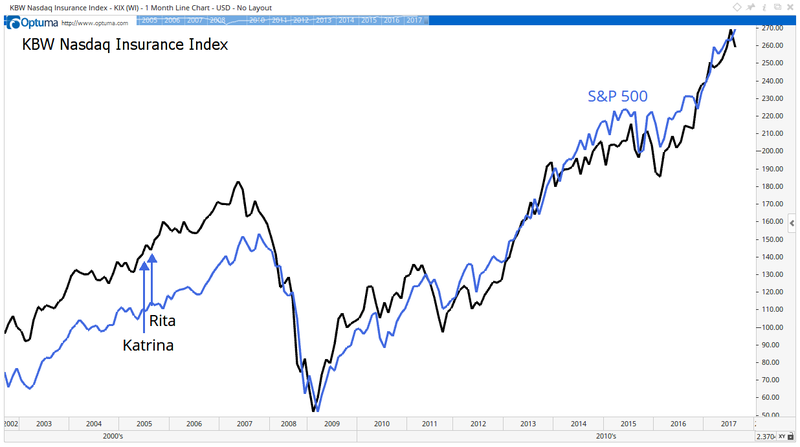 The next chart shows that insurance stocks tend to move in line with the broad stock market. This makes sense. Insurance companies hold large portfolios and are in many ways simply large investment funds. That means insurers will go up if the stock market does. From this perspective, Harvey may be more damaging than Katrina. Federal Reserve data shows that Houston’s economy is more than six times larger than New Orleans’. Houston is also a critical center for the energy industry. Rebuilding Houston will divert resources from the private sector. This could be just enough to trigger a recession. If that happens, stocks will fall, and Harvey will ultimately be to blame.